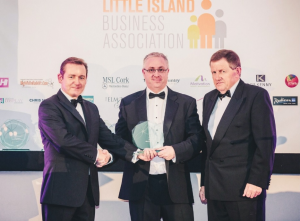 In his announcement, Mr Michael Mulcahy, founder of LIBA stated, “….in acknowledgment of their exceptional growth LIBA are delighted to award Chris Mee Group, the LIBA Training Company of the Year Award for 2015”. Tarik El Amoud, International Business Development Manager with Chris Mee Group, accepted the award on behalf of the organisation. He later said, “…..the Group has grown into a team of over 200 professionals spread across 4 office locations in Ireland and the UK. Today we provide health and safety and environmental training, consulting and recruitment & placement services to clients nationally. We are also expanding internationally and are working with numerous clients outside of Ireland including companies in Libya, United Arab Emirates (UAE), Europe and USA”. CMSE Training, is part of Chris Mee Group, and is a leading provider of classroom/on-site & on-line training courses in Ireland and internationally. CMSE Training is internationally accredited by QQI, NEBOSH, IOSH, SOLAS, STCW, SEAI, Canadian Standards Association (CSA), Road Safety Authority and more. For more information please visit https://www.cmse.ie/training/.